So you have fight with your boyfriend or girlfriend and now you are searching for man vs women quotes i.e. quotes about man and women. If your answer is yes, then you don't need to search for them anymore. As here I have compiled down some of the funniest men and women quotes. Just hope you will like the quote compilation and able to find some funny words to say to your boyfriend or girlfriend. Why does a woman work ten years to change a man, then complain he's not the man she married? Men trust God by risking rejection. Women trust God by waiting. Just as women's bodies are softer than men's, so their understanding is sharper. ...pride for men is like love for women. Very strong. The most important thing for men is pride. The difference between the love of a man and the love of a woman is that a man will always give reasons for loving, but a woman gives no reasons for loving. Men and women play the same game but with different rules. Sometimes a woman needs a man for company, no matter how useless he is. One frequently only finds out how really beautiful a women is, until after considerable acquaintance with her. Basically, all women are nurturers and healers, and all men are mental patients to varying degrees. Can you imagine a world without men? There'd be no crime, and lots of fat happy women. Never marry at all, Dorian. Men marry because they are tired, women, because they are curious: both are disappointed. A lot of men wouldn't like being called a romantic. It's not macho enough.' Quite often men are fools. Women without men, I realized then, are totally different creatures. 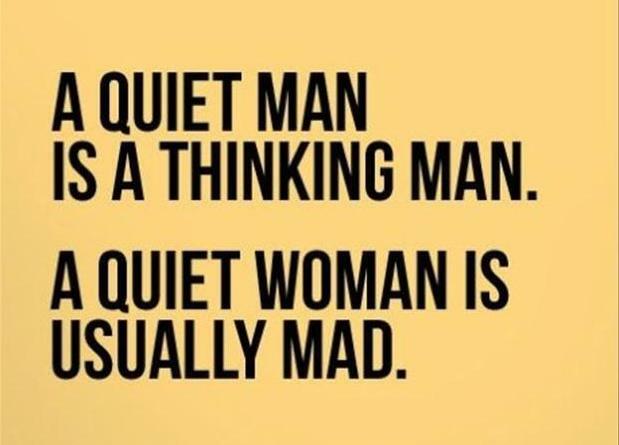 A quiet man is a thinking man, a quiet woman is usually mad.